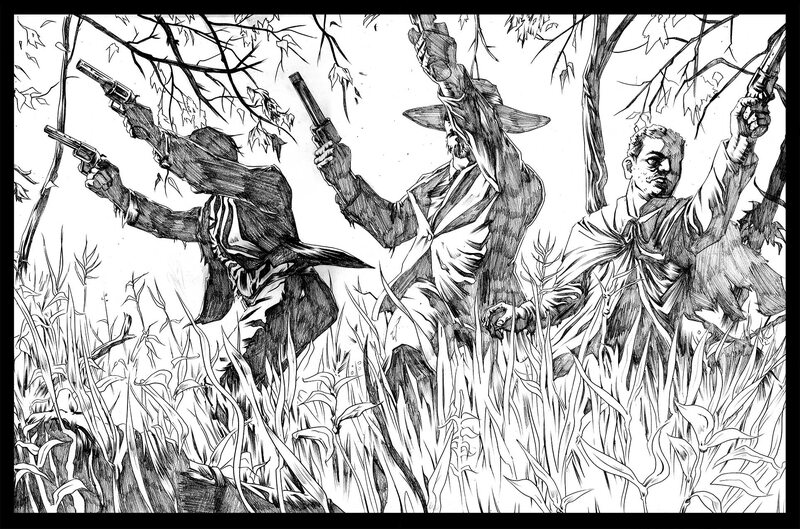 Hey everyone, I spent the last two years adapting and illustrating a historical graphic novel, published by insight comics, about Jesse James and his gang of outlaws that terrorized post civil war America. I think it's a fascinating and important chapter of history, dealing with such issues as, seeing the humanity in your enemy, the consequences of disenfranchising war veterans, and the blurred lines between good and evil. Loving it, but why so much shading? i like it, the use of blacks is unusual for westerns but i think it's well done. The shading gives it a horror feel that may not be inappropriate for this subject. lol id-airgrafic, you got me. The high contrast would suit any western in the bright mid day sunlight, when shadows are strong and harsh. i think the heavy shading looks great. I like the hidden faces a lot, especially in the shooting and riding scenes. it feels like something you would see in a movie, lots of movement and action. the horses look amazing(ive struggled with that before) the guns look great and real which is something I see lots of artist fail at.. the clothes look believable and real. my only gripe is that big double page spread. 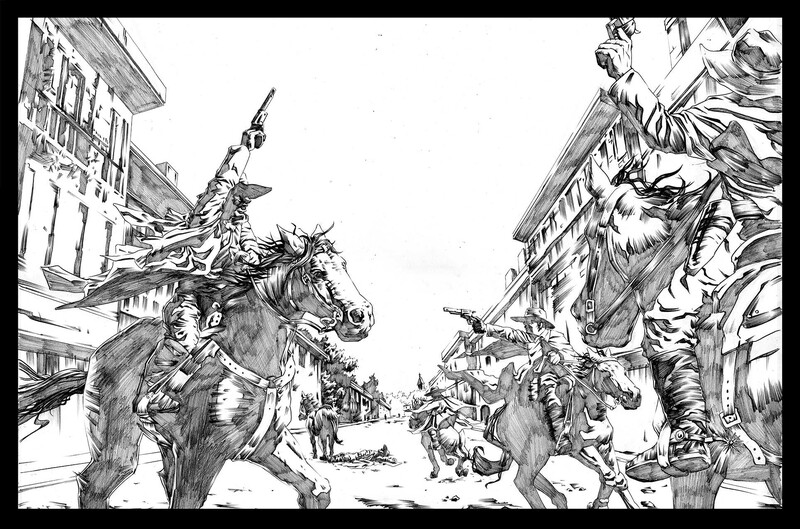 everything looks fantastic, horses, people, clothes, shading, guns.. all of that. BUT, the buildings in the FAR distance in that one point perspective... it feels like you drew one building to many...or..something. it just goes to far. all the buildings are the same height and in a straight line and just..go to far. its hard to explain but I know I had to figure stuff out like that before(failing most of the time). I think the farthest building should be lost and put in some trees or a dust cloud or mountains or something else.. but it just feels..to FAR. I don't know..i hope that makes sense. This. Is. Freaking. AWESOME! I agree on the dense shadows and intense highlights; it's what you would likely see in the midday sun out in the Old West. 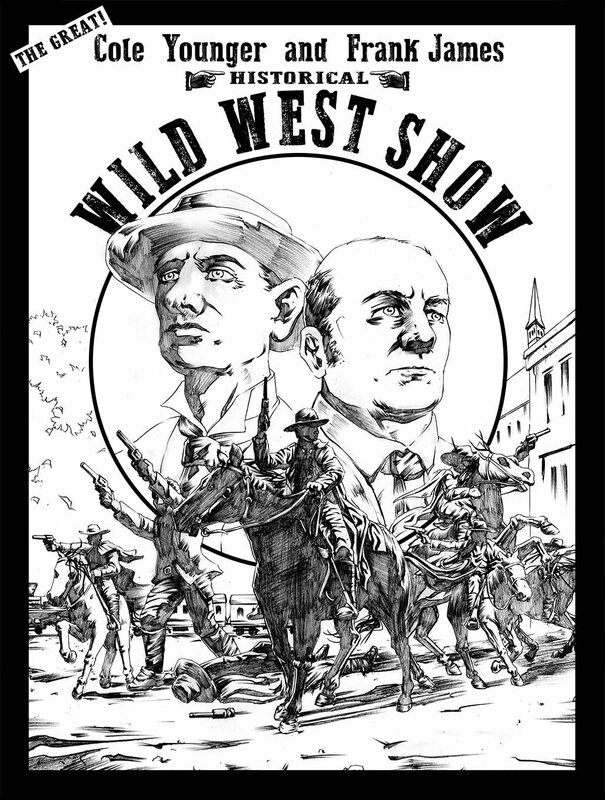 Details on everything look beautiful and, yeah, those horses and guns are mind-blowingly great! A horse is hard enough to render standing still and you've got them in all kinds of crazy action! Kudos to you, sir!